This salad is delicious, and provides generous amounts of protein, high-quality carbs, soluble fiber, and 80 percent of your daily requirement for folate. Place the lettuce in a large bowl. 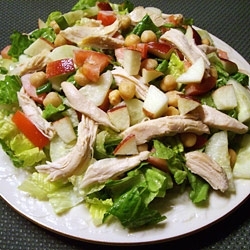 Add the chicken, chickpeas, apple, cucumber, tomato, avocado, celery, scallions, and walnuts. Drizzle with the vinaigrette and toss to coat.